It was once a no-brainer. Round parts were turned on lathes; non-round parts were machined on mills. With the advent of CNC machining centres, which interpolate round part features with ease, the line between the two machining processes became blurred. Here are some of the reasons why our CNC machining service has turned to, well, turning. By adding live-tool (end mill) equipped CNC turning centres to our already extensive three-axis milling service, we’re able to produce better surface finish on cylindrical features and at a typically lower price for customers. Lathe also makes more efficient the manufacture of those parts that may skate on the edge of our milling capabilities. And if the goal is eventual low-volume production, turned parts are good candidates. If you’re still unsure about what parts are lathe-worthy, consider a few household objects. A pint glass, for example, with its smooth, regular shape and length several times greater than the outside diameter is a straightforward exercise on a lathe. Not so on a machining centre. A coffee cup, on the other hand, with its jutting handle and finger-ready hole, is impossible to turn. How about a hose barb for the sprinkler? The v-shaped grooves would require a special cutter on a machining centre, whereas a lathe can use a standard turning tool. The same holds true with a replacement wheel for the barbecue grill, although milling those little mag wheel-like cut-outs on the face would be challenging or outright impossible on most turning machines. Soup cans and salt shakers, water bottles and flower pots—these shapes are what lathes are all about. Milk cartons and picture frames? Not so much. Protolabs does offer a variety of materials to work with, such as aluminium, brass, low carbon steel, stainless steel, steel alloy, and titanium. Size wise, we’ll tackle parts up to 73mm in diameter (sometimes up to 74mm, geometry dependent) by 228mm long, and as small as 4 mm diameter by 1.5mm long. Sharp conical points are okay, as long as the angle is greater than 30 degrees. No promises on ballpoint pen prototypes, or models of drinking straws. As mentioned earlier, our new lathes have milling capability. 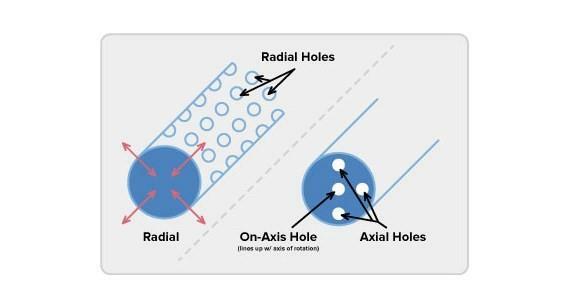 Drilling a side hole or milling a flat is well within their means, as long as that feature is parallel or perpendicular to the long axis of the part. No angled holes yet, sorry. Any milled grooves should be wider than 1.2mm, but because all of our lathes are equipped with a Y-axis, we can machine slots or holes off-centre (within reason). Need your company’s name engraved on the parts? Indented text is best with milling, but on a lathe raised text is best. We can machine most any lettering as long as the line width and character spacing measures at least 0.5mm across. Small holes don’t scare us off, nor do threads. In fact, we’ll drill radial holes down to 2mm and axial holes half that size. Likewise, we support a range of internal and external UNC, UNF, and metric threads.